The 2012 season for the Boston Celtics has been anything but easy. Tumultuous? Maybe. Frustrating at times? Definitely. However, as the playoffs continue to play themselves out, the Celtics are right where they want to be. All season long rumors have swirled around Celtics coach Doc Rivers and his job security, as well as Rajon Rondo and his future with the team. Boston has seen losing streaks reach 8 games amidst the turmoil. They’ve seen key players such as Ray Allen and Kevin Garnett miss significant time due to injury. But somehow, someway, they pulled together and won 38 games in the lockout-shortened season, good for 5th best in the Eastern Conference. After a 4 games to 2 first round series win over the pesky but upbeat Atlanta Hawks, things finally seem to be clicking for Boston as they lead their 2nd round series 2 games to 1 over the young 76ers. As tragic as Derrick Rose’s injury was not just for Chicago but for NBA fans everywhere, it opened the door for Boston. Because of Rose being out, the 8th seeded 76ers bounced the overmatched Bulls in shockingly dominating fashion, advancing to take on the Celtics. During the regular season, the Celtics went undefeated against the 76ers, outscoring Philadelphia by a 49 point margin in 3 games. Not a single player on the 76ers roster had won a playoff series prior to this season’s improbable victory over Chicago in round one. 5 players currently on Boston’s roster have won an NBA championship. Boston has home court advantage, experience, and talent all to their advantage as they find themselves in possession of a commanding 2-1 series advantage. This is likely to be the last opportunity Kevin Garnett, Ray Allen, Paul Pierce, and Rajon Rondo have to bring championship number 18 to Beantown. And don’t think they don’t know and understand that. Boston will continue to play with desire and desperation, especially on the defense end where they take pride in holding their opponents significantly below their scoring average. In their championship run in 2008, the Celtics played lockdown defense on Kobe Bryant in the finals en route to their 17th title. While the Celtics do have offensive firepower with Pierce and Rondo, they love nothing more than frustrating teams on the defensive end. The Celtics have caught their fair share of breaks this postseason, but perhaps the most important one is the injury of Heat forward Chris Bosh. Without Bosh, Miami has looked completely disoriented as they trail the surprising Indiana Pacers 2 games to 1 in their 2nd round series. If the Celtics were to get past Philadelphia, Indiana likely awaits. Boston also dominated Indiana in the regular season, winning both games by 8 and 13 points. Storylines for that series would be extremely intriguing. Pacers GM Larry Bird is a Boston Celtic icon. Indiana is another extremely young team, so if the teams were to meet in the Eastern Conference Finals Boston would likely be the favorite to advance to the finals. Some would argue that no team left remaining in the NBA playoffs has a better chance of winning the NBA title than the Boston Celtics. Boston has experience, talent, and urgency all on their side this postseason. Sometimes, things fall your way. Players get injured, and outgunned cinderallas advance. That’s how the NBA playoffs work. But the Boston Celtics don’t own 17 NBA championships based purely on coincidence. 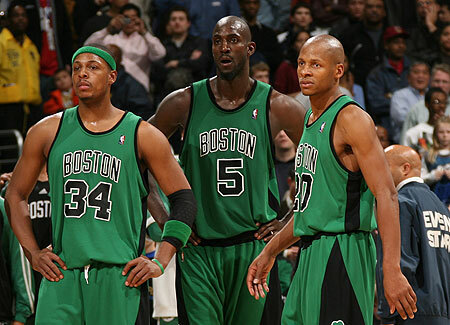 This entry was posted in Basketball, Home, National and tagged Boston Celtics, NBA, Paul Pierce, Rajon Rondo, Ray Allen.